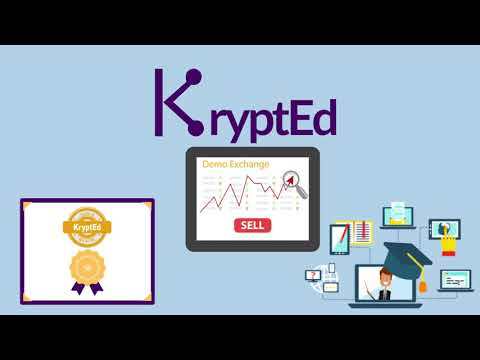 As KryptEd, we place ourselves in the online education sector with an innovative business model. By utilizing Ethereum blockchain technology, we are developing a system designed to increase interaction motivation by rewarding (KED) users with smart contracts and an advanced gamification model. KryptEd’s main goal is to become a ‘Decentralized Autonomous Organization’ (DAO) by 2020, so that even if platform creators are long gone, it can continue to progress on the blockchain. Ethereum Foundation has been working on; Swarm, decentralized data storage and; Whisper, decentralized messaging protocol, we aim to build upon these technologies and create a platform where education contents can be stored on the blockchain for generations to come. We chose to be an organization, which solves the problem of community gathering of expert traders of Tradingview platform; developed and improved study concepts of online education platforms such as Udemy and Coursera; synthesized business models of Earn and Steemit platforms. Through gamifying education and adopting blockchain technology, we are enabling the users to earn rewards for their progress, and thus, increasing the interaction and motivation to make a difference in the world. KryptEd will be a platform where a user or instructor interaction based charging is embraced and where experts can create their own private groups, courses, workshops, webinars and Q&A services. In addition, an advisors showroom will be built where start-ups can find talent for their projects, which involves being able to get assistance to solve technical, legal, and business-related problems. Furthermore, in order to put a stop to diploma forgery, we will implement an encryption and time stamping service where users can store their diplomas/certificates through KryptEd Signature on the blockchain forever. Let'os not skip cryptocurrency exchange simulator but that is still yet to come as part of our plans. The revolution of blockchain technology came fast to finance and software industries, and now we want to provide people with a next generation of an online education platform. KryptEd! The revolution of blockchain technology came fast to finance and software industries, and now we want to provide people with a next generation of an online education platform. KryptEd.